What is the Illinois Great Apple Crunch? The Illinois Great Apple Crunch is a day-long celebration of fresh, local apples. 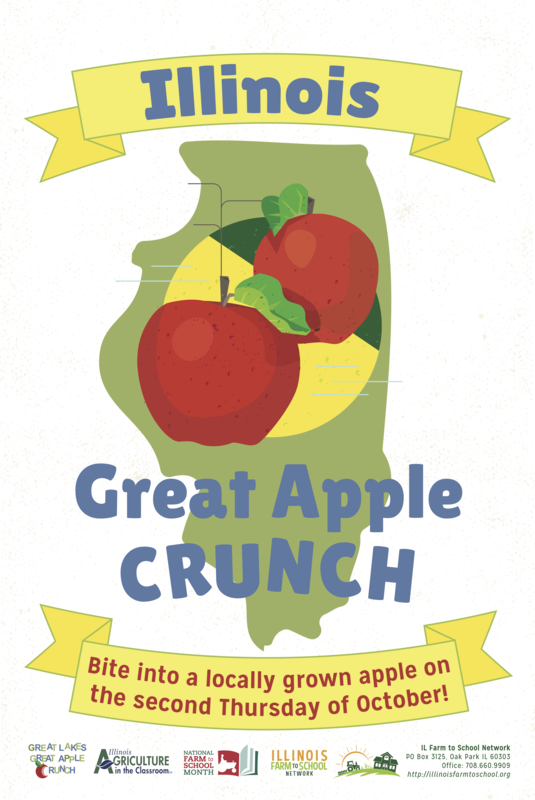 The Illinois Crunch is a part of the Great Lakes Great Apple Crunch celebrated across the Midwest! 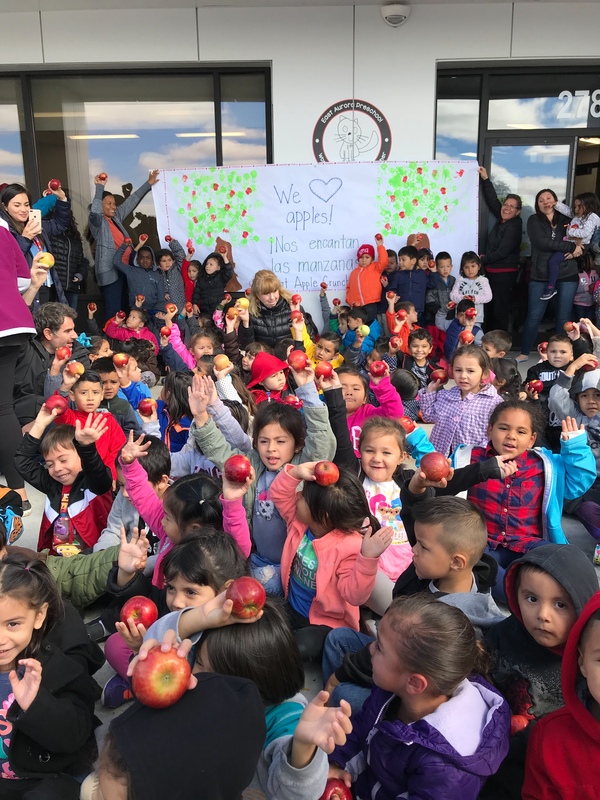 Schools, early child care facilities, and child education programs across the state of Illinois can participate by serving local apples on the lunch tray, or in the classroom, and ‘crunch’-ing into them together at noon. 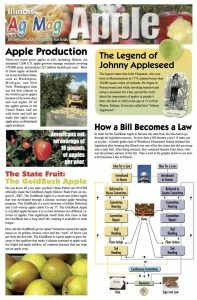 Illinois Farm to School Network provides educational supplements for use in the cafeteria and the classroom that will teach your students all about Illinois apples. Illinois Crunch participants join children and adults from across the Great Lakes region in Indiana, Michigan, Minnesota, Ohio, and Wisconsin in celebrating National Farm to School Month by crunching into locally and regionally grown apples at noon on the second Thursday of October. 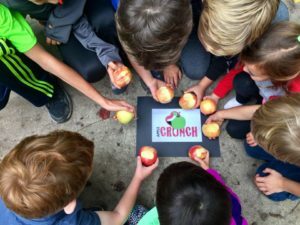 Registered participants are encouraged to participate at noon on Crunch day, but can celebrate on any day or time in October that is convenient for them. Everyone is invited to Crunch, including schools, early care sites, hospitals, colleges, community organizations, after-school and residential programs, and more. Let’s continue to make Illinois the loudest Crunch in the region! 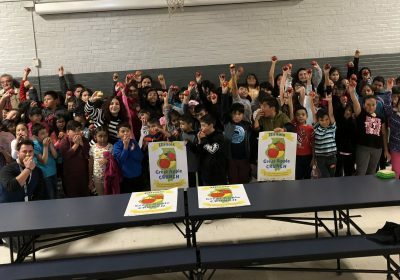 The Illinois Great Apple Crunch is supported through a partnership of the Illinois Farm Bureau, Illinois Ag in the Classroom, and Illinois Farm to School Network. You can read about the developing market for Illinois apple growers here. Registration for the Great Apple Crunch is now closed. Follow us on social media for updates about the next Great Apple Crunch on October 10, 2019. Registration opens on May 15, 2019! Participating in the Illinois Great Apple Crunch is easy. It’s a celebration of local food, namely, apples! You can purchase local apples for your celebration in a number of ways, and your celebration can be held in the cafeteria, outside in a garden or lawn space, or in the classroom. 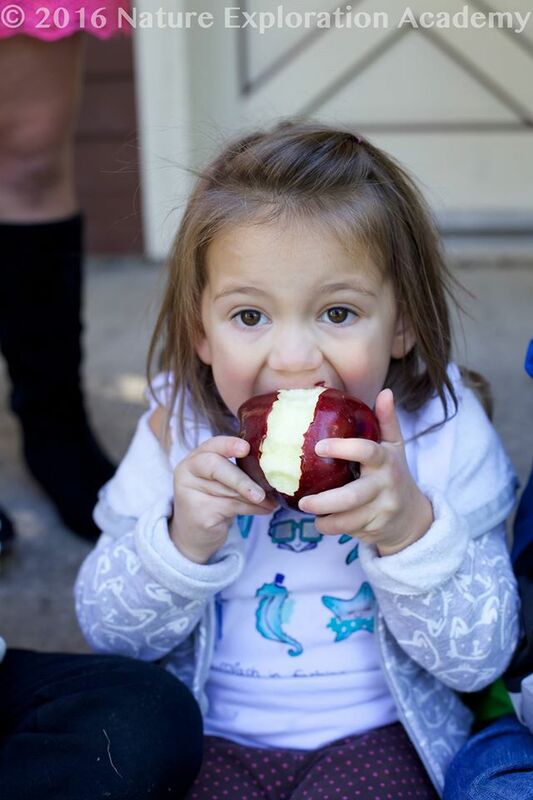 Crunching into local apples on Apple Crunch day, which is always the second Thursday in October, can become a yearly event at your school, or program site. We encourage participants to include educational enrichment activities on that day to promote the knowledge of where food comes from and healthy eating habits. Please share your Crunch on your school’s social media pages! Add a photo of your Crunch with the hashtag #ILGreatAppleCrunch. Check out the hashtag on Crunch day to see Crunches from all over the Midwest. Register your school, feeding site, education program, residential program, or business in our online form (registration opens on June 1st). Locate a source to buy your local apples. We strongly suggest purchasing the apples as opposed to asking for a donation of apples! Farm to School programming was created, in part, to support local producers. Do you have a meal program onsite? Contact your food service manager and share information on the program. Ask them to include local apples on the menu for the second Thursday in October. Adding local apples to the menu should be easy for your food service staff. If there are any questions about which local farms are selling apples, ask your district food service manager to contact their produce vendor and inquire about the availability of local or regional, fresh, whole apples. If your produce vendor isn’t sure where to buy local apples, please contact the Illinois Farm to School Network or the Illinois Farm Bureau for more in-depth assistance. You can also check the Crunch Guide for tips and ways to procure apples! Locate a local orchard and request pricing on smaller-sized apples. Many times orchards do not have a robust market for smaller apples, which could be a benefit for you! Check the Crunch Guide for ways to locate orchards near you! Get a poster! 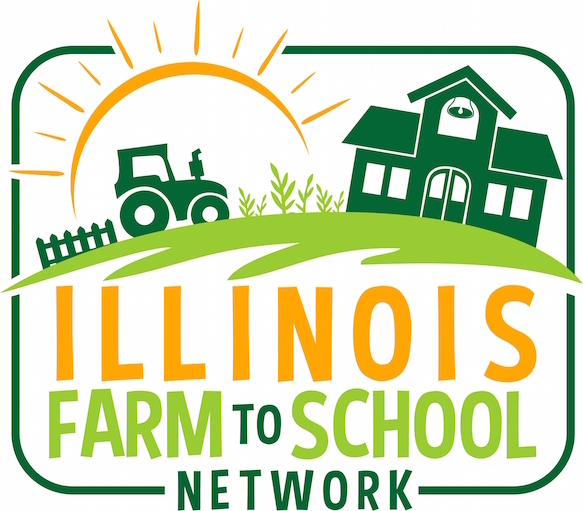 After you register, contact the Illinois Farm to School Network (below) to request a poster for your site(s). Hang the poster up in the cafeteria or in a central location. Download the educational resources, including the Crunch Guide for Illinois. If you have any questions, please contact the Illinois Farm to School Network. Where can I find local apples? The Crunch Guide provides information on buying local apples from your foodservice department or meal vendor, from local grocery and produce markets, farmer’s markets, produce distributors, and direct from area orchards. Check out the Crunch Guide to see all of the tips and best practices in locating and purchasing local apples for your event! Do you have funds available to purchase apples? Ask your participating foodservice department to purchase additional apples for your taste test, or for brown-bag kids at your site. To help your food service department pay for those extra apples look for ways to raise money through your PTA or PTO, or with donations from local businesses and supporters. 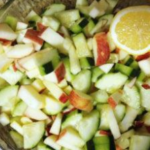 Does your site have wellness or health grant funds that may be a good fit for Apple Crunch? 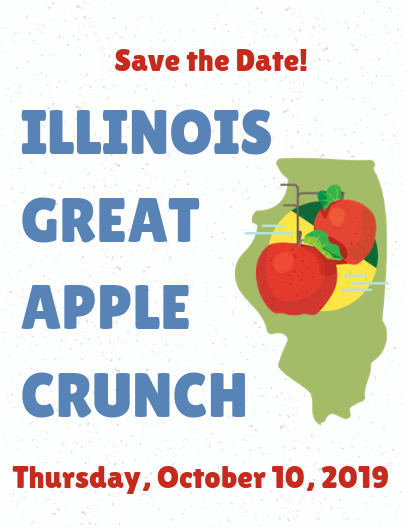 Every site that registers for the IL Great Apple Crunch may request a free poster for use in the cafeteria or classroom! Contact us to receive your 18″ x 24″ copy, or feel free to download and print this PDF. Read through the Illinois Apple Ag Mag during the school day. Order your copy through Illinois Ag in the Classroom. 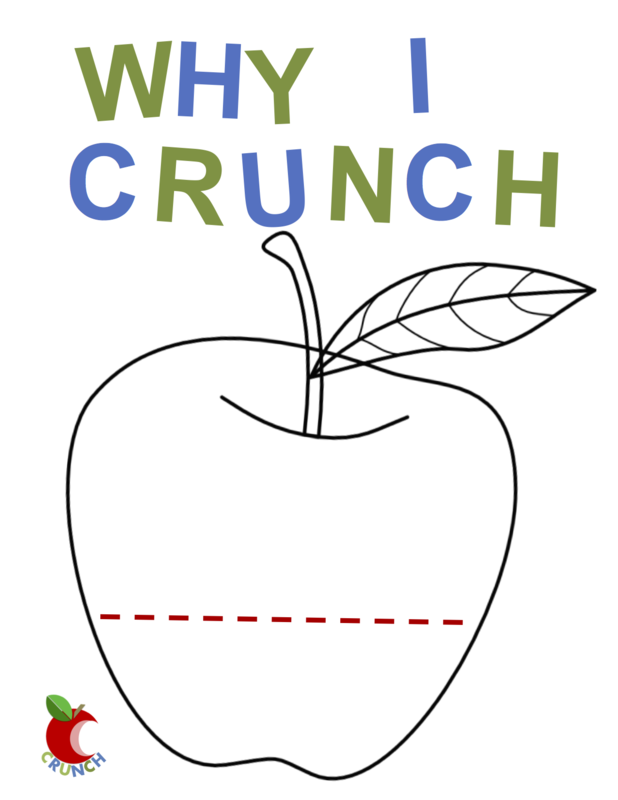 Print out the “Why I Crunch” sheet and use it as an activity for students. Have your students dress up for the Apple Crunch – wearing a t-shirt in the color of their favorite type of apple. Your school will look like a stop light with students dressed in red, yellow and green! Read a book about apples during your classroom story time. Check out your local county Ag in the Classroom office to borrow a book or two. For Early Child Care students, do a fun craft project about apples. Little Bins for Little Hands has lessons for Early Childcare! Go on a field trip to an orchard. 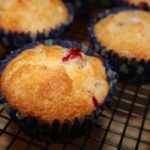 Cook with apples in the classroom! Have a creative apple snack. Use the Great Apple Crunch day to do garden work with your students. If you don’t have a school garden, see if there is a community garden in your area where your students could volunteer. Ag Mag: Here’s a link to download the Illinois Ag Mag! 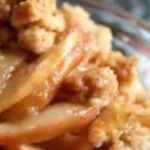 There are many ways to celebrate Apple Crunch in your school or feeding site cafeteria. You can check out the Great Apple Crunch Guide to explore fun ideas, promotions, and activities perfect for the cafeteria! Organizing the Great Apple Crunch Day in your cafeteria can be as easy as crunching into local apples at the halfway point of your lunch period(s) and snapping photos of your staff and students to share on social media. You can also utilize apple recipes all month long via school food service and promote local apples in several different ways. Featuring a weekly Apple Fun Fact with a new recipe on the lunch menu can build interest in the main event and keep your students engaged throughout the month of October! You can find tools for both methods of cafeteria participation listed below. Happy Crunching! On Crunch Day, be sure to announce the event in the cafeteria. A teacher or school administrator could announce the event, or if you have multiple lunch periods, you could give information and instructions to a school cafeteria worker to read aloud to the students. Make sure that all students and staff know that this is the Great Apple Crunch by advertising and sharing the upcoming event in school announcements, on your school’s website, and on social media. “Students, don’t eat your apples yet! 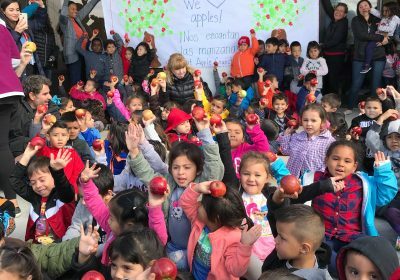 Today is the Illinois Great Apple Crunch and we are going to CRUNCH into our apples together alongside students from across the Midwest. The apples on our plates are from a local farm (add more details about where the apples are from!). Apples take many months to grow and it’s important to eat them in the fall when they are fresh. Midwestern apples are crispy, crunchy and sweet. Eating local apples is great for the state of Illinois! During lunch, or whenever the apples are served, be sure to announce the Crunch to the students. Feel free to speak about the Crunch on your own or read from our pre-made ‘script,’ found above. Hang posters! Every site that registers for the IL Great Apple Crunch may request a free poster for use in the cafeteria or classroom! Contact us to receive your 18″ x 24″ copy, or feel free to download and print this PDF. Display the name of the apple farm in the lunch line. You can find this listed on the box of apples or contact your produce distribution company to get this information. During the lunch periods, have all of your students’ CRUNCH into their apples at the same time! It’s fun and loud! Take a photo of your students CRUNCHING and submit it to us on the website or share with us via social media that day! The best way to educate about good health and eating right, and create interest in local foods is to repeat the number of times your students are exposed to the food. Everyone knows kids like apples. However, sharing information about how apples are grown, where they are grown and fun facts about apples like “how many apples does it take to make an apple pie?” will make learning interesting and fun. This can be accomplished by serving local apples once a week throughout October in honor of the Great Apple Crunch and National Farm to School Month and celebrating apples every time. When you feature a local apple recipe, be sure to share interesting facts about those apples. 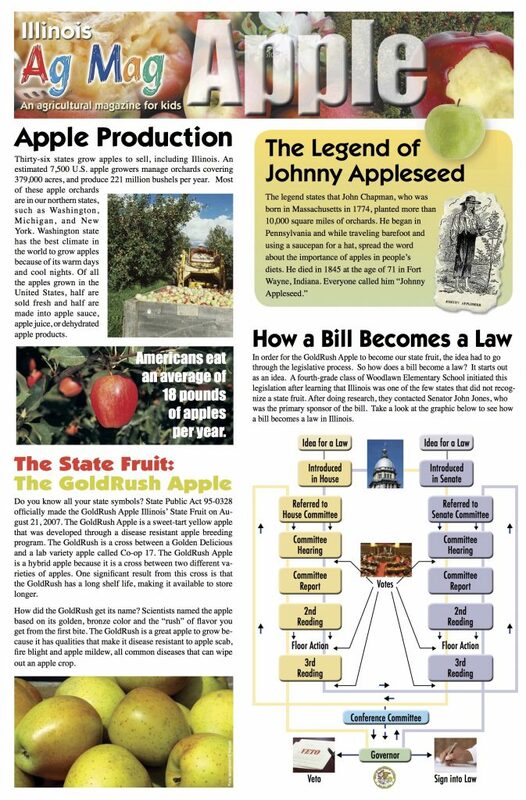 Nutrition facts and facts about apple varieties grown in Illinois, along with the location of the orchards in your area are a great way to keep your students engaged. You can find fun and nutrition facts from the University of Illinois Extension here. And, from the Illinois Farm Bureau here. Do you need help to find local or regional apples for your food service? 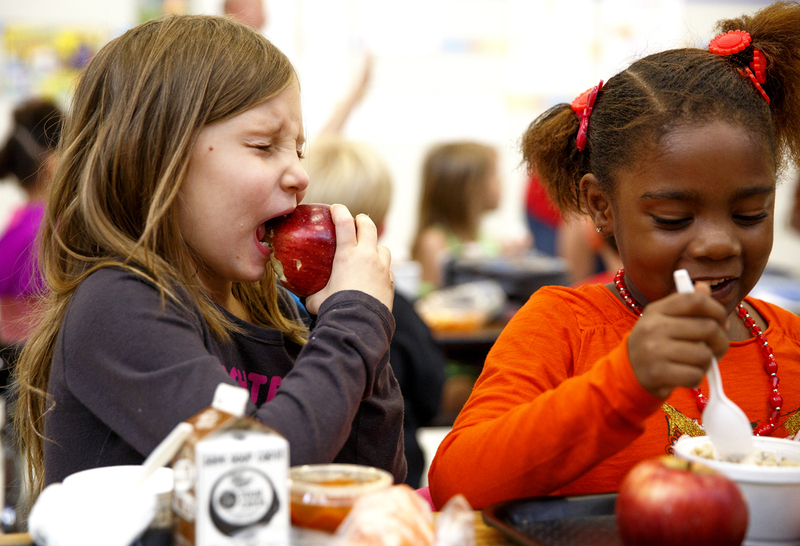 Here are a few ways to get those local apples on your lunch tray! Here are just a few of the apple recipes we have for school lunch. 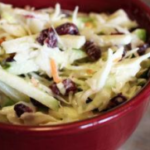 These recipes come from our Illinois Harvest of the Month program and have been developed for food service with nutritional data and USDA meal components included. Illinois has been participating in the Great Lakes Great Apple Crunch since 2015. You can view a report for each year below. 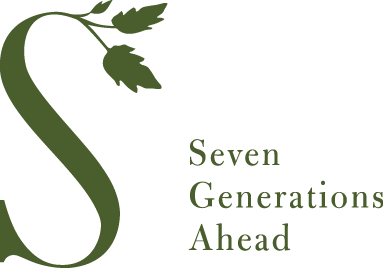 For a more in-depth overview about farm to school programming in Illinois, see the inaugural (2015) report. The Illinois Great Apple Crunch is an event coordinated by many agencies. Thank you to all of our sponsors for helping make this event possible each year!